Where is Bosnia and Herzegovina located on the world map? 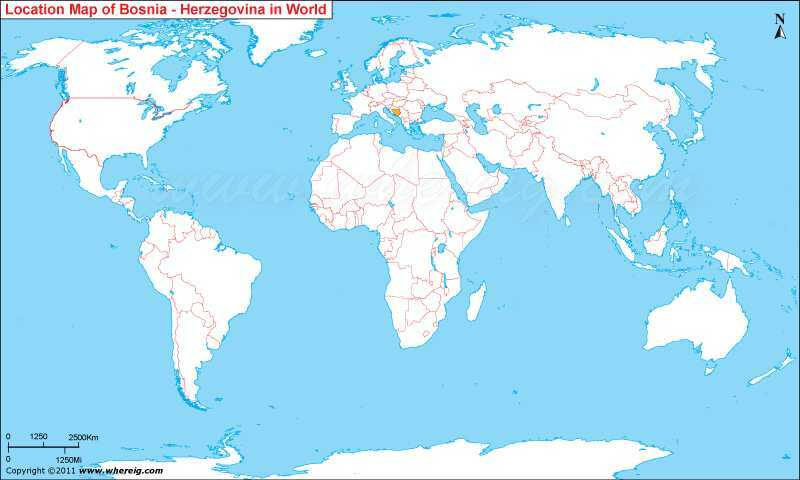 To point out the exact location of Bosnia Herzegovina on the world map is a difficult task; this is why the given location map of Bosnia Herzegovina has been shown very clearly the location of Bosnia and Herzegovina on the world map. So, as Bosnia Herzegovina map shows that Bosnia Herzegovina is located in the Southern Europe, which is part of Balkan region. Bosnia Herzegovina shares its international boundaries with Croatia from the north, west and south, Serbia from the east, and Montenegro from the southeast. Besides, country has also about 26 km coastline opening into Adriatic Sea. Geographically, the country has diversified relief features - the interior of the country is mountainous, hills in the northwest, and the northeast part is flat surface. Since, country is almost landlocked hence; the climate type of country is continental featured by hot summer and cold, snowy winters. However, the southern tip i.e. nearby coastline, country has a Mediterranean climate. Bosnia Herzegovina homes three ethnic groups, popularly known as "constituent people." The term is quite unique for Bosnia-Herzegovina. Among them, Bosniaks are the largest population group, whereas Serbs are second and Croats are third. Surprisingly, the terms Herzegovinian and Bosnian are maintained as a regional rather than ethnic distinction. Above all, Herzegovina has no specifically defined borders of its own. Banja Luka- More popularly known as the "Green City"; art city, city of three nations, sport city, and culture.